The anaerobic treatment project provided a solution that would meet the future processing, environmental and energy needs of Dairygold while at the same time providing cost effective treatment capacity strategy. The project, which was completed in 2012, involved the construction and commissioning of a 45,000 m3 anaerobic digester for wastewater treatment. This project together with the Niro 3 spray dryer project represented a significant capital investment by Dairygold in the future of milk processing in North Cork. One of the principal rationales for Dairygold’s technology choice was energy considerations. The other was to choose a technology that met the BREF and EPA guidance for Best Available Technology (BAT). The anaerobic treatment process meets both of these objectives. The process provides lower biomass yields than conventional aerobic process, allows for higher loading rates and the production of biogas as side product of the process wastewater treatment. The digester is designed to pretreat the process wastewater from Dairygold’s production facility prior to entering the pre-existing biological nutrient removal (BNR) system. The process wastewater results from powder milk and cheese production wastewater and high-strength salty whey. The reactor anaerobically digests a high percentage of the raw wastewater biochemical oxygen demand (BOD) and total suspended solids (TSS) loadings while converting the degradable organics in the wastewater to energy-rich biogas and a small amount of waste biomass (sludge). The reactor releases a high-quality anaerobic effluent to feed the existing downstream BNR system with an average BOD removal of 90 percent. The reactor is completely covered with a specialized floating geomembrane cover, which collects the generated biogas. The gas production is intimately linked to the BOD loading on the reactor and the Biogas produced during the AD process is used in a dual-fuel boiler to produce hot water to heat the reactor. Surplus biogas is used for supplementing heating requirements in a plant boiler. 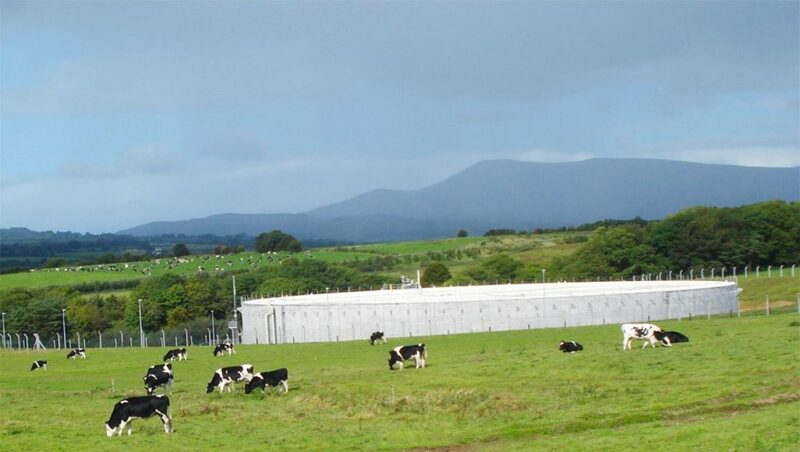 Thus Dairygold achieves energy efficient treatment and produces additional energy from excess biogas. There has been a multifaceted approach to energy management in Dairygold over many years which has served to improve energy performance. A number of projects (both large and small and involving the organisation and communication of energy) have been completed in the last 5 years. Dairygold has had a long commitment to Energy Management. It installed CHP as part of its management strategy in the 1990’s and adopted the predecessor to ISO50001, EN16001. This coupled with other energy projects has improved the energy performance. In 2011, we embarked on the lean manufacturing journey. Since then systems have been developed to improve the manufacturing, problem solving and communication processes. These systems include visual management meetings and workgroups which are used to communicate essential business information in a visual manner. Lean is now part of the Dairygold’s everyday culture. The integration of energy management in to the Lean process was a natural development and the first step was to use Hoshin Kanri (strategy deployment). This is a method devised to capture and cement strategic goals as well as flashes of insight about the future and develop the means to bring these into reality. This process provides for senior management approval for the project. The advantage of incorporation of ISO50001 in to these measures is that communication and therefore energy management is discussed with all managers present. Issues can be resolved quickly through investigation and changes in trends discussed in real time. The installation of a new dryer in Castlefarm was reviewed through the ISO50001 procurement and design process. The engineering team reviewed available technologies and choose the most energy efficient processes to include in the dryer. There were a number of capital spends which will have a direct positive impact the energy efficiency and environmental performance of the dryer. In 2013 Economisers were installed in the boilers in Clonmel Road. The calculated savings from this investment is in the region of 1,500,000 kWh. Other parts of the business are also engaged in energy management projects. For instance the Agri division has moved from heavy fuel oil to LPG while at the same time has started a changeover programme from diesel to LPG in its grain dryers. Further energy savings projects have resulted in a 20% increase in output and reduced energy wastage. The Co-Op Superstores has recently installed LED lighting in the Mallow branch and is developing a replacement programme in the future amongst a number of other initiatives. Dairygold is currently certified to ISO50001 and continues to meet the international management standard. It can therefore be said that the integration of ISO50001 with the lean manufacturing has been a success for both the management system and Dairygold.